Recently myself and some other core developers of eXist-db, an Open Source project which I have been involved in for over five years now, decided to start a commercial venture offering Support and Consultancy around the Open Source project: the new venture is called eXist Solutions. Whilst it is still early days for our company, things have been going well. We are very much International in our approach and philosophy; in fact, at present no two shareholders of the company are even from the same country! I am one of two Directors of the company, and my counterpart Wolfgang Meier is based in Rüsselsheim, Germany. 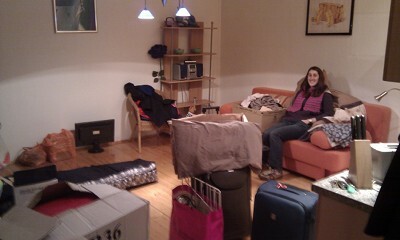 Along with my partner Liz, we recently decided to move to Frankfurt for about six months (if all goes well). The reasons for this are two-fold: 1) to support the rapid start-up of eXist Solutions by working very closely with Wolfgang, and 2) to experience life and have an adventure in a foreign country with Liz for a prolonged period of time. We left home in Exeter at 07.00 for Calais and briefly stopped at Clacket Lane for some brunch. We arrived at Calais an hour earlier than we expected, and so we visited all the sights:the Castle-- which was closed so were were asked to leave--and then the Morrisons carpark! The ferry was meant to depart Dover for Calais at 13.50, but did not leave until after 14.30. The captain thought it would be a good idea to inform everyone that this was because one of the engines was not working. As a child of the 80's, who remembers clearly a number of Ferry disasters in the news, this was not the smoothest start to the Journey.However, as I had bought priority tickets (because I thought we would be tired), we had access to the Club Lounge, which was great. We had the entire place to ourselves, and we got to relax on sofas in front of big glass windows right on the bow of the ship whilst being provided with complimentary drinks. Disembarking in Calais, we drove around to find a petrol station and cash-point, as I had been thoroughly warned about toll-roads (though we did not encounter one). Refuelled, we then headed on towards Bruxelles. Whilst driving in France was smooth, driving in Belgium was somewhat intimidating as all the vehicles we encountered were moving fast and acting aggressively. I have never been to Bruxelles before (except whilst changing trains for the Euro Star), the city itself is a completely mad place to drive in, full of multi-lane tunnels, on/off-ramps, and aggressive drivers. Without the Sat-Nav, we would have been completely screwed. We arrived at the Mariott Executive Apartments around 17.30; very comfortable apartment and bed awaited, but not before a quick swim (why was the pool so cold?) 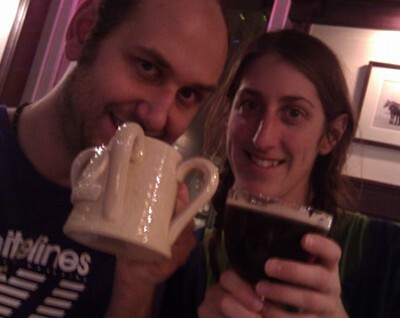 and then popping out to sample a couple of Belgian Beers at the local Beer Factory. We left Bruxelles at 07.30 heading for Frankfurt. The journey was easy enough, and whilst there is no real speed limit on parts of the Auto Bahn, I found the driving easier than in Belgium, apart from, of course, the odd racing driver in the outside lane pushing us aside. We saw some snow on our journey around the fields outside of Köln; unfortunately, it died out as we headed further south. We had arranged to stay at Paragon Apartments, a serviced apartment complex in Frankfurt. As we came into Frankfurt, we realised that these were located in Niederrad, which was quite fortunate, as we had stayed here on a previous visit and had some experience of navigating into the centre of Frankfurt by public transport from there. We reached the apartment at about 12.00, where we checked-in and unloaded the car. We had a brief rest and then started flat hunting at 14.15. 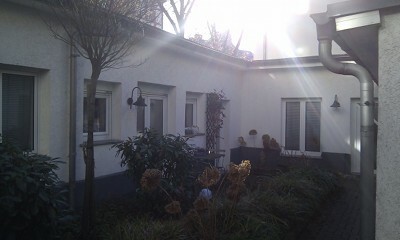 We had pre-arranged to view four flats via an agency in Frankfurt called CityResidence. 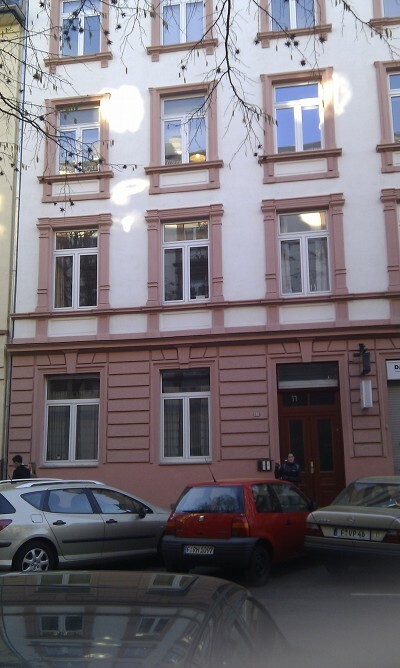 The first three flats that we viewed were located in the Bornhein and Nordend areas of Frankfurt, and the last was located in the banking sector in Innedstat. After flat hunting we returned to our apartment to try and make a decision. Each flat had advantages and disadvantages.We decided to settle on a flat in Vogelsbergstraße, located very close to Bergerstraße in Bornheim. This is a very vibrant area which Liz was keen on. On contacting CityResidence by phone to make an offer, we were informed that the landlady may not be keen as we are quite a short-term let, and that they also had another client viewing the property the next day, so they would inform us the following morning. Feeling deflated, we had a quick sleep and then headed out into Frankfurt for dinner. We had a great dinner at a fantastic little Thai restaurant we found on the web called Ko Samui, it had a very good vegetarian menu and a great atmosphere. Finally we had a lie-in! After not hearing from the property agent in the morning we checked our email, to find that our offer had been accepted and that we had to sign a contract and immediately pay the deposit and first months rent for the apartment. Before coming to Germany I set up a personal account with CitiBank as they were one of the easiest options for maintaining a personal account in Euros whilst being a UK resident. However having to now immediately transfer a couple of thousand Euros presented an issue. I could not withdraw substantial quantities from an ATM, and neither could I walk into a local branch and arrange the transfer. We made arrangements, and then visited CityResidence's offices where we signed the contracts and attempted to do the transfer via. CitiBank's website whilst they witnessed it; however, this failed spectacularly. Unfortunately CitiBank's Internet Banking is very limited and whilst it would let me transfer Pounds Sterling to almost anywhere, it is not much use when your account is maintained in Euros, and it won't let you send Euros. Finally I arranged the transfer via. telephone with CitiBank and they agreed to fax a confirmation to CityResidence. For the afternoon, we explored the streets and shops around where our new apartment would be. We then walked down and up Bergerstraße itself and had a great meal at Manolya a Turkish restaurant we had visited on a previous trip to Frankfurt with friends from the eXist-db project. However, first I had some business to attend to. I had arranged to visit the TIGZ Innovation Centre in Gustavsburg, just outside Mainz with my co-Director of eXist Solutions Wolfgang Meier, with the idea of renting some new office space for eXist Solutions. The TIGZ Centre is a pleasant old red-brick building, with lots to offer in terms of meeting and conferencing facilities alongside modern office space. That afternoon, we spent in Rüsselsheim with Wolfgang trying to arrange Broadband Internet for our new flat and mobile phone Sim Cards. It seems that making such arrangements is incredibly complex, and quite a lot of it requires that you are a German citizen with an ID Card. Unfortunately we have as yet not been able to arrange Internet or Mobile Phones for Liz and I, but I am hopeful that we can arrange something soon. The afternoon was also unfortunately plagued by administrative stress, as CitiBank had not sent a fax confirmation of the money transfer to CityResidence. After several phone calls to CityBank, and several assurances that this would be done within the hour, no fax was ever received by CityResidence. I feel greatly let down. 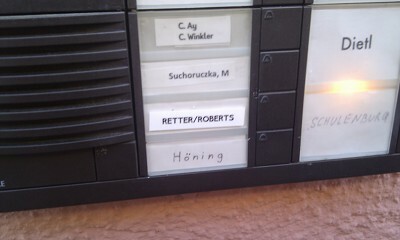 Fortunately CityResidence agreed to accept a print-out from my Internet Banking showing the money transfer. At 17.00 we moved into our flat in Vogelsbergstraße. Its not a big flat, just 47sqm, with two rooms plus a bathroom. Rental prices in Frankfurt are astronomical for furnished flats. We are paying €890 / month and we have to pay an additional commission to the agent which I think is ~200€ / month. But its a nice enough flat ground floor flat with a small terrace, and I feel very positive about the flat and the area that we are living in. So far, apart from the odd small issue, which is to be expected, everything has been quite easy for us. Whilst letting agents in Germany have a much lesser role than in the UK (whilst charging much more) and appear to be little more than a property advertising mechanism, if our letting agents had not been able to speak fantastic English, then I suspect this would have been much harder for us as our German language skills are very basic. Glad things are going smoothly. I was in Hamm (120km North of Köln (Cologne) over Christmas) and had loads of snow!! It's a lovely part of the world, although I must confess I don't know Frankfurt. I wish you the best of luck in your venture and I look forward toseeing you - maybe in Germany next time we visit!!! Glad you and Liz have settled in so soon. The flat looks really nice. It sounds like a few german lessons would come in handy. Good luck with your new flat and the eXist venture. Oh all sounds wicked guys! You're flat looks lovely! :-) can't wait to see it! Sounds like a great adventure! And that its all going smoothly! Let us know when you're online so we can arrange a proper skype chat.